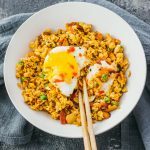 Fast and easy dinner recipe for cauliflower fried "rice" with chopped kimchi and crispy bacon. Heat bacon strips in a single layer on a large pan over medium heat. Cook until crispy, turning them occasionally, for 5 to 10 minutes. Transfer bacon to a paper towel to drain and cool. Add minced garlic to the pan with bacon drippings. Stir as the garlic browns, less than a minute. Add peas, carrots, and kimchi. Increase to medium-high heat. Cook until everything is tender, a few minutes, stirring frequently. Add cauliflower rice, cooking for a few minutes until tender, stirring frequently. Pour beaten eggs on top. Immediately stir to scramble the eggs until they're cooked and everything is well-mixed, about a minute. Drizzle sriracha on top, and stir until well-mixed, about a minute. Remove the pan from heat. Crumble bacon into small pieces over the pan and stir them in. Serve in bowls. Optionally top with fried eggs, sesame seeds, a drizzle of chili sauce, and a swirl of sesame oil. This recipe yields 7.5 g net carbs per serving. Nutrition information does not include optional toppings.